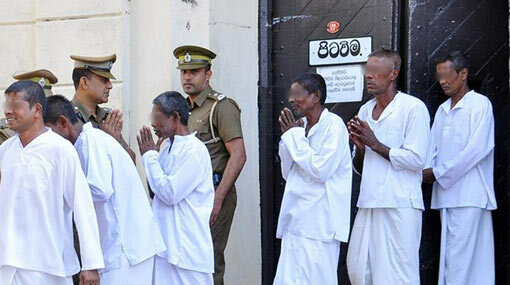 Colombo, February 4 (newsin.asia): Over 500 prisoners were released under a Presidential Pardon from prisons across Sri Lanka on Monday to mark the 71st anniversary celebrations of the country’s National Day. Prison Department Commissioner H.M.T.N. Upuldeniya said that 545 prisoners serving jail terms “for minor offenses” were released under the pardon based on their behavior during the detention period. Ven Gnanasara Thero, an extremist anti-Muslim Buddhist monk belonging to the Bodu Bala Sena (BBS), who had been sentenced to six years in jail for contempt of court, was not among those released, even though influential Sinhala and Buddhist nationalist organizations were campaigning for his release. Also, no Tamil political prisoners/terror suspects, languishing in jail even though the war against Tamil terrorism ended in ten years ago, were released, despite national and international movements seeking their release on humanitarian grounds. Clearly, these could not be categorized as minor offenders. Earlier, in a statement appealing to the President not to release radical monk Gananasara Tjero, the Lawyers for Democracy (LfD) said that it was concerned about reports indicating a possible grant of presidential pardon to Rev. Galagoda Aththe Gnanasara, who was well known for his aggressive conduct and inciting of violence, particularly communal hatred. In August 2018, Rev. Galagoda Aththe Gnanasara was convicted by the Court of Appeal on four charges of contempt of court for disturbing the criminal proceedings in the well of the Magistrate’s Court of Homagama, inter alia, threatening the State Counsel. The incident has been immediately subsequent to a refusal of an application for bail by military intelligence officers who were suspects in a disappearance case. He was sentenced to 19 years of rigorous imprisonment to be served concurrently to be completed within 6 years. He was also previously convicted by the Homagama Magistrate in June 2018 for intimidating witness-victim Mrs. Sandya Ekneligoda in the court and sentenced to 6 months rigorous imprisonment. We have come to know that Rev. Gnanasara has a previous conviction on 22-5-200 in Magistrate Court case number 6315/200 in Colombo Traffic Court on the charge of causing an accident while driving under the influence of alcohol. We are made to understand that there are investigations pending against him regarding other criminal conduct including the communal riots in Aluthgama. The President’s power to pardon a convict is subject to judicial review. In our view, prior to pardoning a criminal, report should be called from the Hon. Attorney General and Ministry of Justice. We are aware that neither the Attorney General nor the Minister of Justice has submitted any report regarding the pardoning of this convict. These observations become indispensable as the pardon that will be administered will be for the offence of contempt of court and will signal to the public that it is possible to act in such threatening manner in a court room and with complete disregard to the judiciary and officers of law, and thereafter use the fact that the criminal belongs to the priesthood and through political influence obtain such a pardon. A pardon if not exercised with due diligence and careful consideration of the rule of law implications will contribute to a culture of impunity. We are surprised to read the letter of the Minister of Buddha Sasana forwarding several requests from personalities claiming to be religious leaders addressed to the President in respect of seeking a pardon. We emphasize that the Minister of Buddha Sasana has no legitimate role to play in pardoning a criminal. This is a rear instance of a convict who was sentenced to imprisonment due to his intimidatory behavior in the well of the Court and intimidate the prosecuting State Counsel. Pardoning him will have a chilling effect on the judiciary and the Attorney General’s Department. We have seen an unfortunate build-up of media reports justify pardoning of this convict suggesting that he has contributed immensely to Buddhism. It is our view that this media hype appears to have vested political interest. Contrary to the position that appears to be promoted by this reportage, Rev. 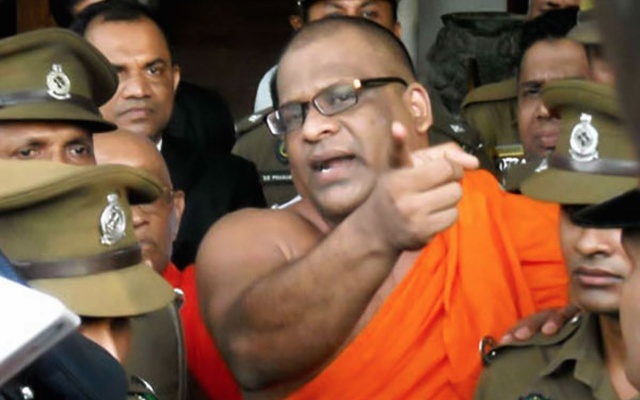 Gnanasara is seen an aggressive violent individual who worked against ethnic and religious harmony of this country and who was an active politician. We have no doubt that his release will have serious adverse impact on the Ekneligoda disappearance case and all other pending cases of political significance particularly those involving the military. Such a pardon will strengthen impunity in Sri Lanka and discourage victims and witnesses from pursuing justice, as the system would be seen as failing them. This will also create a negative antecedent, particularly of the office of the President which will be perceived as protecting a convict who disrupted and threatened legitimate judicial proceedings. It will also diminish respect for and in the office of the Hon. Attorney General. The statement was signed by the Conveners of LfD: Lal Wijenayake, K.S. Ratnavale, J.C. Weliamuna, Sudarshana Gunawardane, Sudath Neththasinghe, Prabodha Rathanyaka, Harishke Samaranayaka.